To Tube Scream or Not! That is the Question!!! That guy just put a 100 dollar Tube Screamer through a 3000 dollar Heritage and a 3000 dollar Divided by 13 amp. I bet that amp scream when you turn it up. The Tube Screamer is very popular and often copies. I was an MRX guy back in the day. I use a Fulltone Full Drive II, but I also have a Fulltone OCD, that never made it to my pedal board. For a while back in the day I used a RAT distortion pedal. 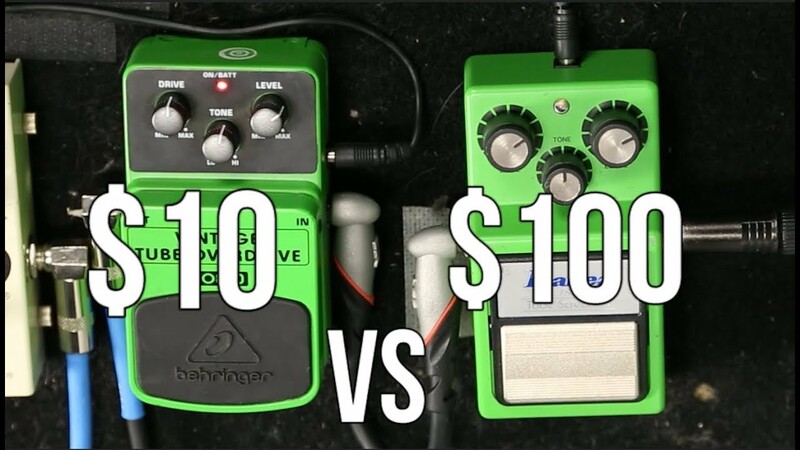 Yeah, I thought it was rather ironic that they would do a video on "cheap pedals", but use a really nice, high-end amp and guitar to show it off. The Tube Screamer is very popular and often copies. The Tube Screamer is quite possibly THE most copied pedal of all time. If it isn't, it's gotta be one of the top three. I was an MRX guy back in the day. I use a Fulltone Full Drive II, but I also have a Fulltone OCD, that never made it to my pedal board. I LOVE my V3 OCD - it's one of my all-time favorite dirt pedals. If you like the Rat, you should check out the Animals Pedal Tioga Road Cycling Distortion review I recently did - it's basically a Rat at heart, but with some boutique pedal designer component tweaks, and three different clipping options - symmetrical (like a stock Rat), asymmetrical, and no diodes. Plus, at $119 "street", it's affordable too. The video made perfect sence to me. Everyone raves about the SRV tone coming from the Tube Screamer but rarely mention the Dumble and Fender amp mix he had. Priced any Dumble amps recently? In 2012, some fetched $150,000. On the other hand, he put a $10 pedal though that amp and it sounded great. At home, when I'm mixing up a sound 99 percent of the time I'm engaging my pedals with my hands and plastic housings like the Berringer or Danelectro don't take on abuse other applications do. At the same time your amp has to sound good because a pedal isn't going to fix it. I've always been a fan of the theory that says the whole chain matters... guitar, cables, pedals, amp - it's all important. I've had these pedals in my MF wish list for a good while now. The flanger because my beloved Ibanez CF7 developed a crackle even when not engaged. I damn near cried. The 3rd Dimension pedal I bought after watching many videos on the Boss WAZA DC2W and I mean it was in the shopping cart several times. I just couldn't pull the trigger on a single pedal over $200. Then watching one review someone mentioned a clone; I searched and found the 3rd Dimension and both were $20 off last week. Then after the review of the TO800 at Morty Music, I said what the hell for $19 it's worth a try. TO800: Worth every penny. A fantastic sounding pedal. I'm stunned it sounds so good. I love metal and it's not metal, but I also love Blackberry Smoke, SRV and ZZ Top and it's definitely all of that. The Flanger and the 800 came out of the box with the dials and noon and without touching the knobs it's a perfect Heart's Barracuda. The 3rd Dimension is awesome and I'm thrilled with the way it sounds too. I got that because I found where SRV recorded Couldn't Stand the Weather, and while working with David Bowie was introduced the Boss unit and then went back and used it on CStW. Funny thing on the TC pedals even though they have those buttons that look like they make that hard click sound; well then don't. It's a soft on and off. The 800 on the other hand I would think it would be a soft on and off like a Boss pedal; well it's not, it actually clicks. You can't hear a click at the foot switch on the TC pedals, but you can hear a tick from the amp when they are engaged. Funny enough I have a Mojomojo pedal that has the normal switch and makes no clicking sound through the amp when engaged. On the 800, if I were going to use it on a gigging pedal board it would need another housing over it to protect it to include the cables going into and out of it. If you were to transfer the components to another housing you would want to swap the pots, input and output, and the on and off switch for more sturdy components. The other two are like tanks. Last edited by mikesr1963; 11-25-2018, 04:15 PM. I went with the more high-fallutin' Joyo clone for $30. I think it's called the Vintage Overdrive. It sounds exactly like a Tube Screamer to me. Couldn't say which, the 808/TS9/TS10 differences are mostly lost on me. I just like the midrangey thing it does. I used to own an original Ibanez back in the 80's, then got bored had a programable Ibanez which had soft switching. I have the Joyo and the Behringer at the moment. The Behringer is dirt cheap but it does use the same Chip as the Ibanez. Allot of complaints out there about those pedals being cheaply built but I've owned a bunch of them and never had a problem. If anything the knobs feel a bit cheesy because they are PC mount pots and the knobs have long shafts to reach the board inside. you can tighten the knobs up and prevent them from spinning easily by putting rubber washers under the knobs. TS are typically set to one level then you kick them off and on. With the washers the knobs stay set where you leave them. The Joyo version is a bit brighter and louder compared to the Behringer which seems to have a tad more clean and mids mixed in. I think the Behringer is a TS9 clone where as the Joyo is an 808 clone. They both do a decent job as a clone copying an Ibanez and given their low cost you're simply throwing your cash out the window blowing it on an original.